A new Paul Thomas Anderson film does not get me as excited as most movie buffs. He is one of those directors that just seems to have passed me by. Even though plenty of people rate him as possibly the greatest contemporary director, I have only seen one of his films for some reason. All that being said, I still follow the news when one of this films is coming up and always intend to check it out. 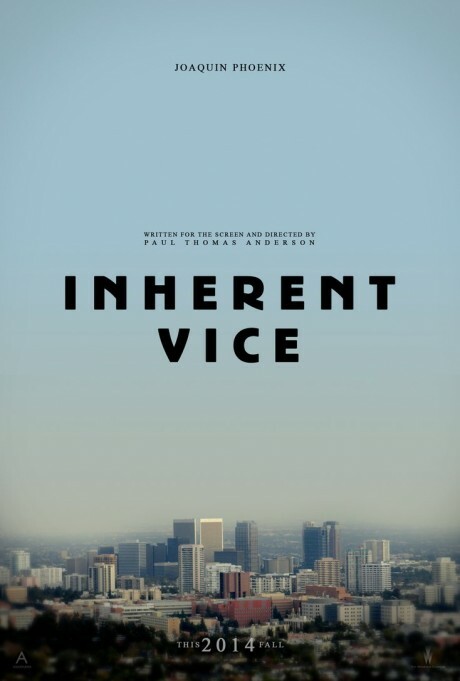 Same with Inherent Vice (2014) which is due toward the end of the year. Check out the poster below for the film. For some reason I really like this design. Much of the space is made up of blue sky which is pretty bold, as is not slapping Joaquin Phoenix’s mug on there. I like the inclusion of the cityscape, which taken in context of the title, suggests some sort of urban noir possibly being on the way. I’m actually not 100% sure if this is an official poster or a fan one, but it doesn’t really matter, because it has certainly piqued my interest in the film. What do you guys think of it? Related beermovie.net articles for you to check out: Three fantastic Enemy posters and Captain America: The Winter Soldier character posters. Yeah, I really like the understated aspect of it too. Could definitely handle a really good LA noir in my life. I like it. Very simple. And I LOVE PTA. Which of his films have you seen? You HAVE to see TWBB and Magnolia! Noted. Will get on it. Which is the film you have seen? Yeah man. I like that clean aspect to it. Punch Drunk Love is shamefully all I have seen of his. Ah right, well one of my all time favourite films is Magnolia, but that divides people a little more than say Boogie Nights or There Will be Blood. Yeah Magnolia is one I have been meaning to check out for a while. I know it is on the 1001 (as is Boogie Nights I think, but could be wrong).